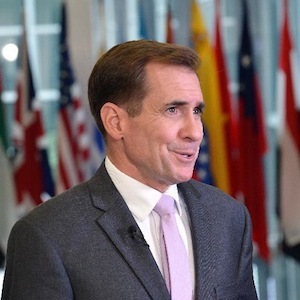 U.S. Department of State spokesperson John Kirby, who retired as a Rear Admiral in May 2015. Photo courtesy U.S. State Department. Retired Rear Admiral John Kirby is featured at two free, public events today at the University of South Florida Tampa Campus. The current spokesperson for the Department of State, Kirby, is the keynote speaker at the USF Veterans Day Ceremony at 10 a.m. in the Marshall Student Center Ballroom A. Later at 1 pm, Kirby will be part of a presentation, “U.S. Foreign Policy in a Turbulent World,” on campus at the Patel Center for Global Solutions, Room 138. Kirby is a former chief spokesman for the Department of Defense and former Secretary of Defense Chuck Hagel, a USF alumnus and St. Petersburg native. He retired from the Navy in May 2015. Other events for USF’s Veterans Week are scheduled to honor the nearly 2,000 veterans and their family members attending USF. 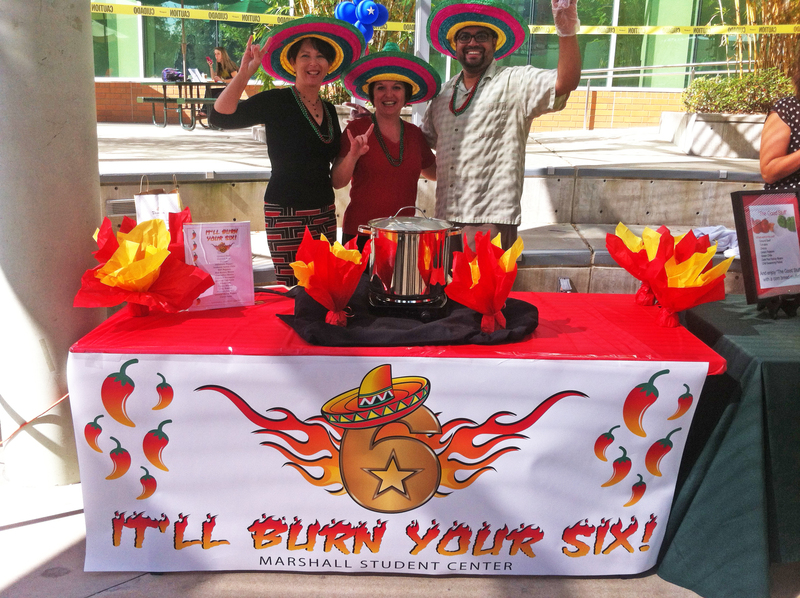 On Wednesday, Nov. 4 from 11 am to 12:30 pm is the 6th Annual Chili Cook-Off at the Marshall Center Amphitheater. USF departments compete to be named for the top chili recipe. Free samples of chili are sampled by attendees who vote for their favorites. A Salute to Service Football Game, USF vs. Temple, is scheduled Nov. 14 at Raymond James Stadium. Active duty military and veterans will be recognized during a presentation at the game. Naming the chili is half the fun of participating in 2013 Annual USF Office of Veterans Services Chili Cook-Off. Photo courtesy of OVS. Navy veteran John Tedesco holds up a newspaper article from 1991 when he and several buddies from the Great Lakes Naval Training Station filed claims for VA benefits related to their mustard gas exposure. Navy veteran John Tedesco while serving during WWII. A photo of Joan, his future wife, is tucked into the frame. 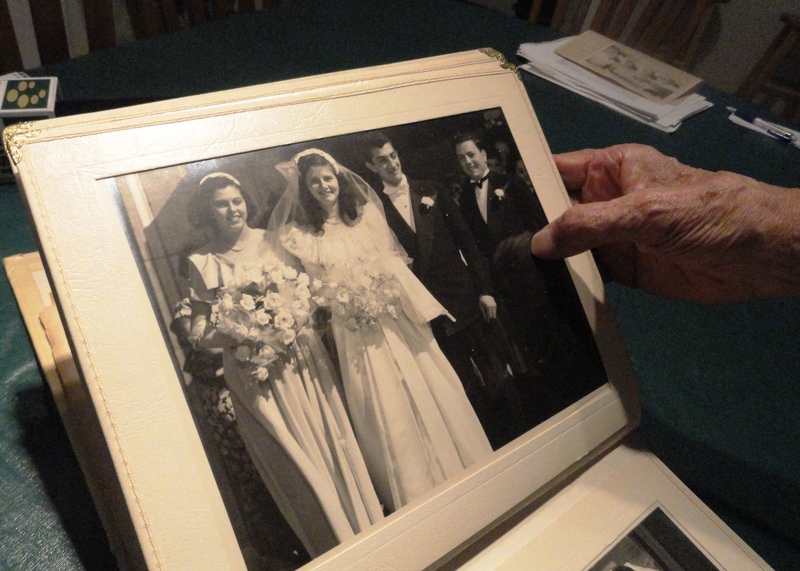 Joan and John Tedesco married more than 67 years. So, when the testing became public, Tedesco and his friends from boot camp went down to their local veterans’ office and filed VA claims. Tedesco would try again with more evidence – a copy of a letter written home about the mustard gas tests by a friend in the same company at Great Lakes. But that claim was denied too. He wasn’t the only veteran to disillusioned after being exposed to mustard gas and denied benefits. A copy of the 1944 letter that mentions the company’s mustard gas testing at Great Lakes Naval Training Station. Dickerson spent months digging through documents and the 1991 congressional testimony when those promises were made to care for the thousands of WWII veterans exposed to mustard gas by their own government. And that NPR investigation has refocused attention on veterans who were exposed but did not receive VA benefits. It’s hard finding evidence because the mustard gas experiments were kept secret for almost a half century after WWII ended. But Dickerson said the vets could be helped by a ruling in 2006 that allows a veteran’s testimony to serve as evidence. A veteran has to prove that they were injury in the military, that their disability or illness is service related and still affecting them today. Dickerson said the VA is now handling all mustard gas claims through one office. “These mustard gas claims are very specific because, again, they in many cases, they lack that essential evidence. 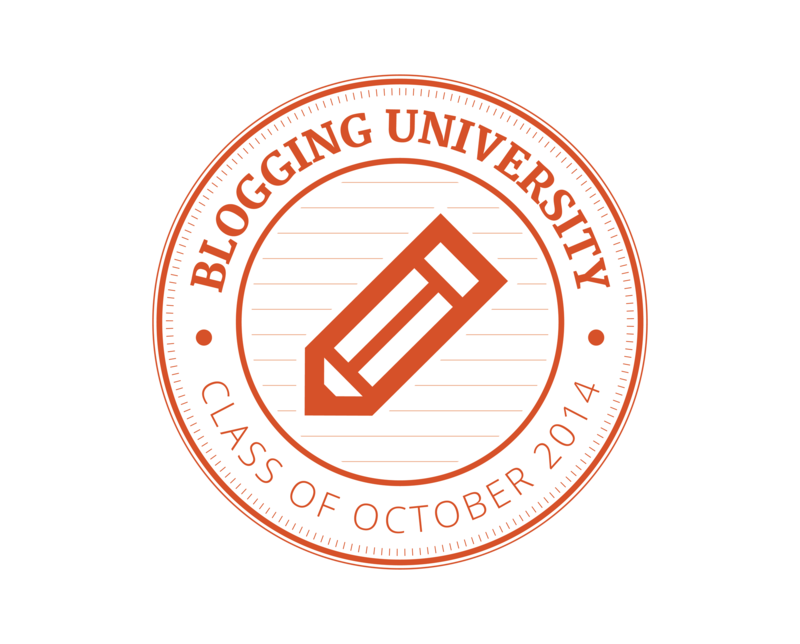 And they’re more nuanced,” Dickerson said. 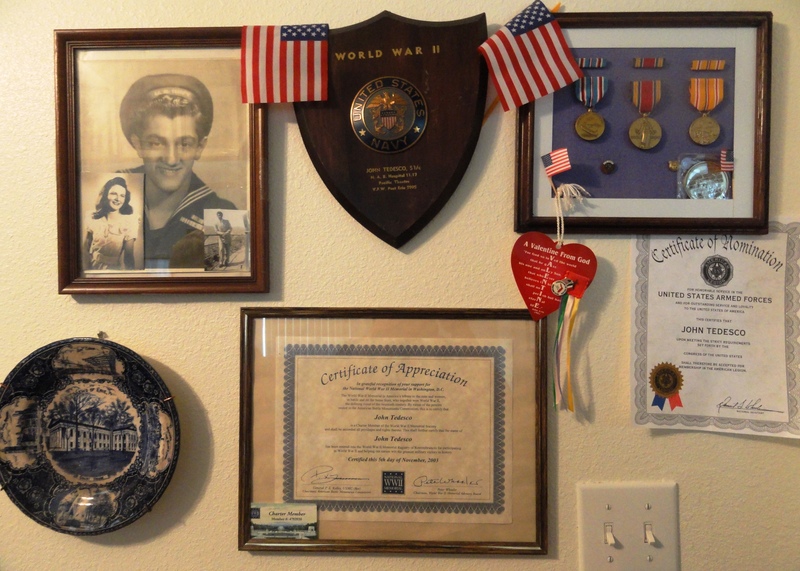 John Tedesco’s wall of memorabilia from his WWII service in the Pacific. Several members of congress responded to the NPR series. Florida U.S. Sen. Bill Nelson (D-FL) is one of a dozen senators who wrote the VA Secretary requesting that the VA immediately contact exposed veterans and review all pending and denied mustard gas claims. By mid-July, Tedesco had received a VA letter offering to review his denied claim. The 88-year-old retired carpenter and contractor filled out the VA form again requesting benefits for his mustard gas exposure from 71 years ago. You can read Sen. Nelson’s full letter to VA Secretary Bob McDonald here. 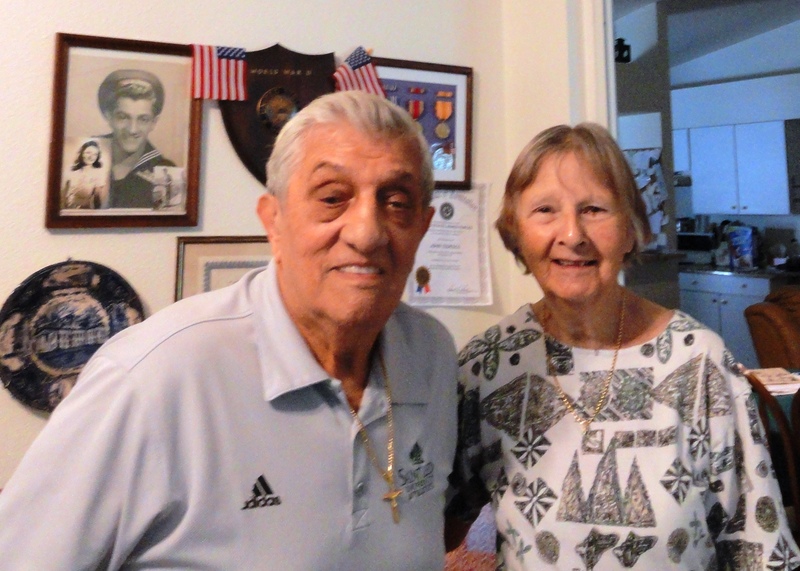 John and Joan Tedesco stand before a wall filled with World War II memorabilia including John’s service photograph. This week – NPR revealed that 60,000 World War II veterans were exposed to mustard gas while training in the U.S. and some are currently living in the Tampa Bay region. The NPR investigation found that the Department of Veterans Affairs failed to keep its promise to help any of the mustard gas veterans who had permanent injuries. After the NPR investigation, the VA is again pledging to reach out to ensure exposed veterans are getting the benefits they’ve earned. And the vice-chairman of the U.S. House Committee on Veterans Affairs, U.S. Rep. Gus Bilirakis, has called for a hearing and offered his assistance to one of his constituents, John Tedesco of Pasco County. 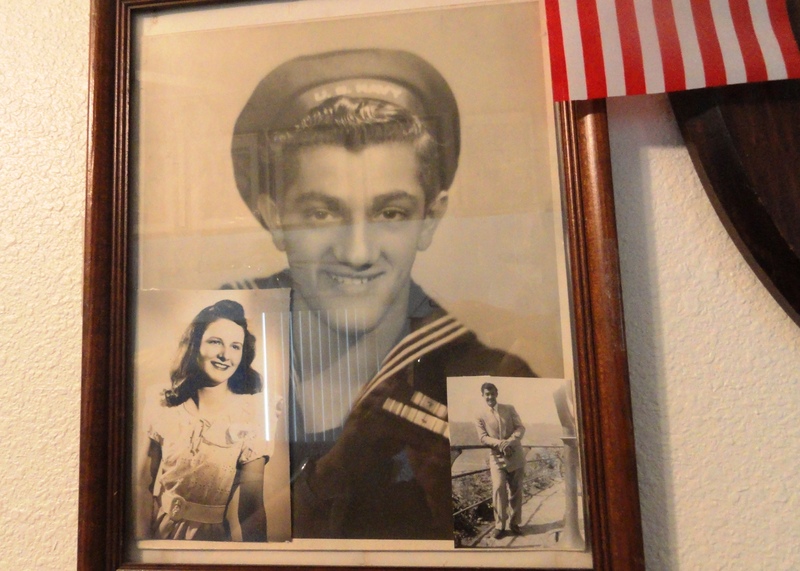 John Tedesco as a US Navy Seaman First Class in WWII – notice the photo of Joan tucked into the left corner. Tedesco said he was part of the Navy’s mustard gas experiments conducted at Great Lakes Naval Training Station in early 1944. He was 17 years old. Now 88 years old, Tedesco doesn’t remember specifics of the mustard gas test, he does remember being checked by doctors and corpsmen at noon each day after the test for more than a week. Some of his buddies from Company 92 at Great Lakes were able to give detailed accounts in a 1991 Erie, Pennsylvania newspaper article. It was published shortly after the U.S. Department of Defense declassified the mustard gas experiments. “When I was back in Erie and I met some of the fellas, they said they were going to go put a claim in because they were all kind of sick too,” Tedesco said adding that his group went to the local veterans affairs office together to fill out paperwork and then to the VA for two days of tests. He said his claim was denied. John Tedesco holds up the 1991 newspaper article that details how he and some of his friends from Erie, PA were used for mustard gas experiments while at the Great Lakes Naval Training Station in 1944. Tedesco said he developed breathing problems shortly after joining the Navy. He got out in May 1946 but didn’t go to the VA about his health issues until 1991 – more than four decades later. A photo of Joan and John Tedesco’s wedding in October 1947. His wife of 67 years, Joan Tedesco, said her husband’s health problems were really bad when they lived in California in the 1960s. Their son, Dr. John Tedesco, is a family physician practicing in Wesley Chapel. He also has vivid memories of when they lived in California. “My father was in construction. They said he was having allergy problems but what it was it was asthma,” Dr. Tedesco said. 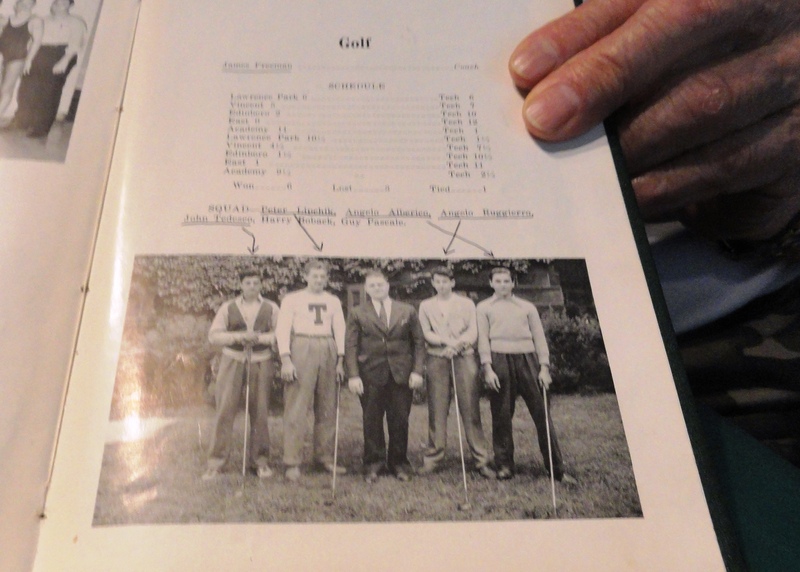 A high school yearbook photo of John Tedesco on the golf team when he was in eleventh grade. His health issues limited his ability to play sports with his children. He said his dad’s breathing problems prevented him from even simple joys like playing sports with his children. Dr. Tedesco believes his father’s asthma is not due to allergies but instead related to his mustard gas exposure. He even wrote a letter to the VA to help his father file another mustard gas claim – that too was rejected. After a while, the World War II veteran who spent 21 months in the Solomon Islands and New Guinea just gave up. Hearing of Tedesco’s plight, his member of congress, U.S. Rep. Gus Bilirakis, promised to help. “We’re going to reach out to him and if he gives me permission to advocate on his behalf, I certainly will,” Bilirakis said. The vice-chairman of the U.S. House Committee on Veterans Affairs, told NPR he’s working on bringing in VA officials to testify, and has already requested a hearing. Knowing what he knows now — Tedesco says he’d volunteer to serve today if asked. 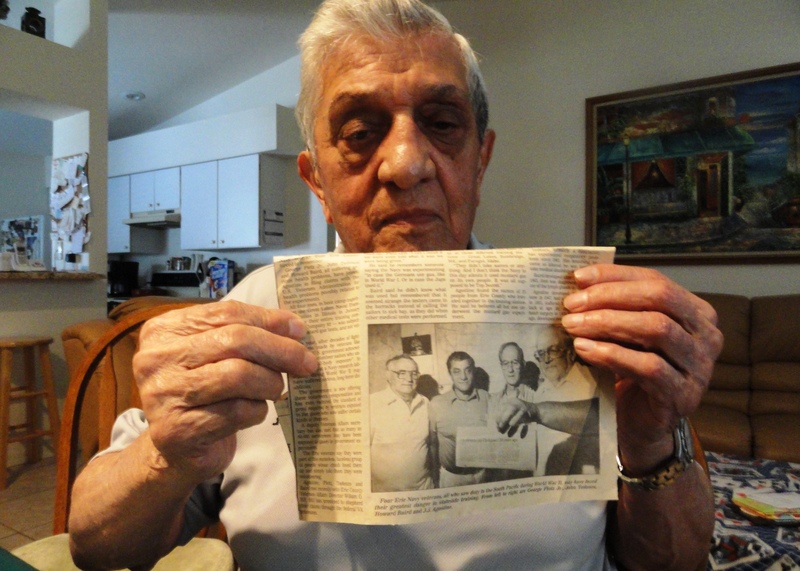 World War II Navy veteran John Tedesco holds up a newspaper article that details when he and several Navy buddies also exposed to mustard gas filed VA claims in 1991 after the testing was declassified. John Tedesco, 88, is a Tampa Bay area veteran who said he was exposed to mustard gas in basic training — before he shipped out to the Pacific in 1944. 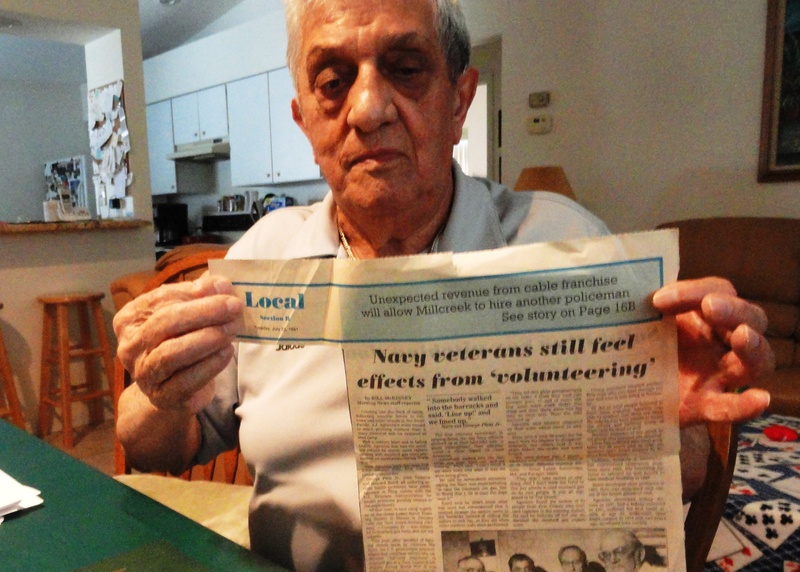 Like many who enlisted during World War II, Tedesco was young when he signed up for the Navy in November 1943. It was less than a month after he turned 17 years old. 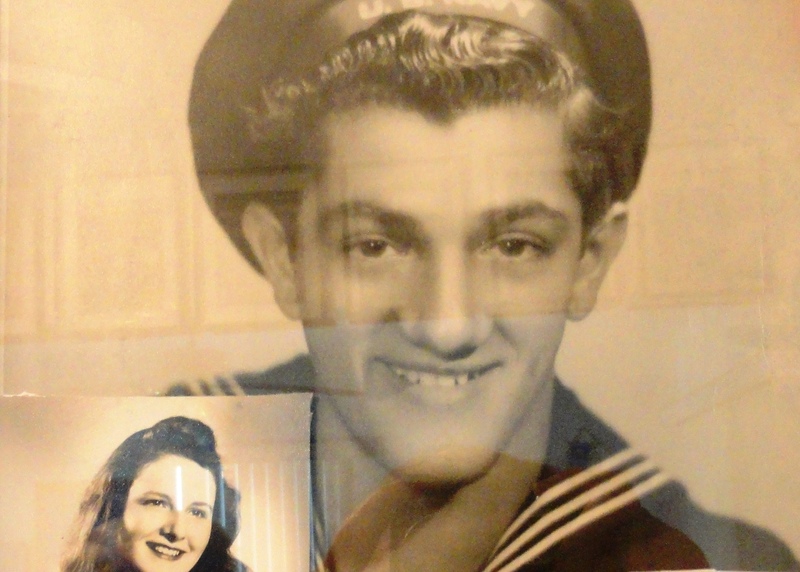 John Tedesco while serving in the Navy during WWII. In the left corner, a photograph of his then girlfriend, now, wife of 67 years. By January 1945, Tedesco and several friends from Erie, Pennsylvania were in boot camp together at the Great Lakes Naval Training Station just north of Chicago. That’s where Tedesco said he and a couple of his buddies were exposed to mustard gas. He said no one objected – at the time – you did what you were told to do. “We were all young, 17 years old – 18 years old. You know,” Tedesco said. 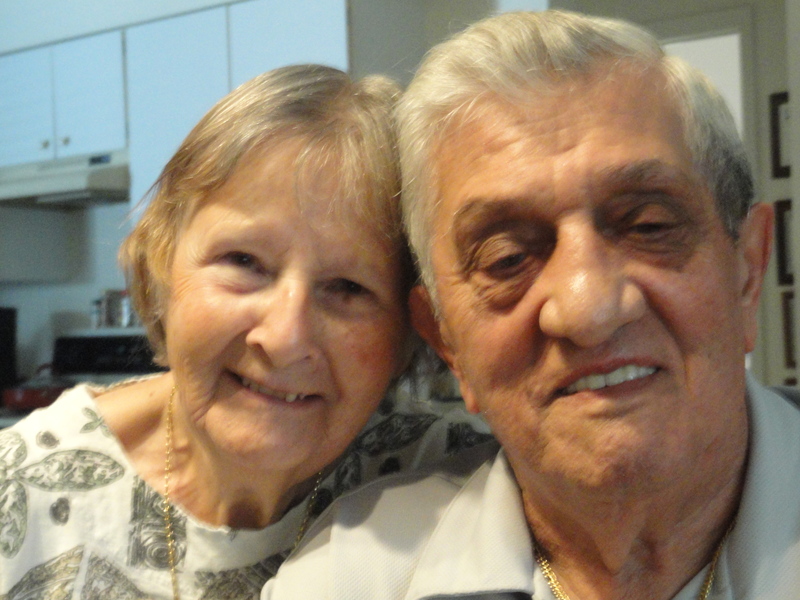 He doesn’t remember the specifics of the mustard gas test — but he recalls what came next. In a few months, Tedesco was on his way to the Solomon Islands in the Pacific and later New Guinea. He would serve 21 months overseas. He was discharged May 2, 1946 in California. Tedesco said he suffers from asthma and had to retire early from his job as a carpenter and building contractor, at age 57, because of chronic breathing problems. 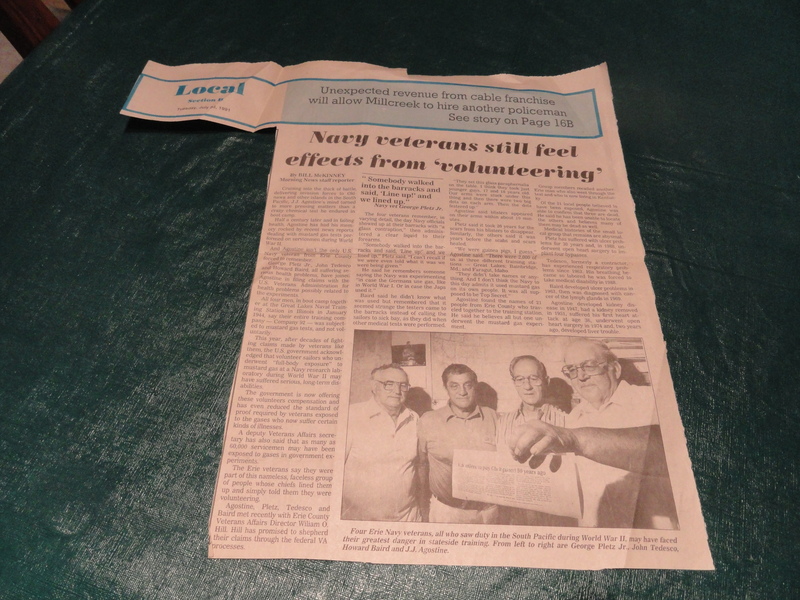 A photo of the July 1991 newspaper article that gives details from four WWII sailors who say they were subjected to mustard gas experiments while in basic training at Great Lakes Naval Training Station in 1944. He said he and some of his friends filed claims with the VA in 1991 when the mustard gas experiments were declassified. Their quest was written up in the local Erie newspaper. But Tedesco said his claim was denied. 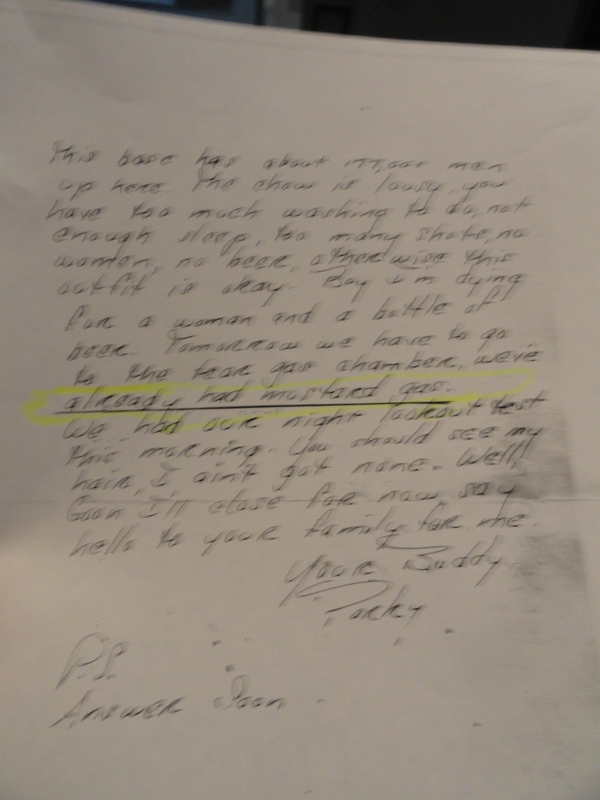 He said he tried again when he got more proof – a copy of a letter a friend wrote while they were in boot camp together. “And in that letter, he mentioned that we were mustard gassed and he had my name mentioned that we were there,” Tedesco said. But again, the VA denied his claim, Tedesco said. That’s when he just let it go because he didn’t want to jeopardize the disability payment he does receive for hearing loss and a leg wound suffered in the war. The VA has responded to NPR’s series on Broken Promises To Vets Exposed To Mustard Gas and lawmakers are promising take action including U.S. Rep. Gus Bilirakis, vice-chairman of the US House Committee on Veterans Affairs. Bilirakis’ office has reached out to Tedesco to offer help getting his VA claim reviewed. Marines and sailors with Marine Expeditionary Brigade – Afghanistan load onto a KC-130 aircraft on the Camp Bastion flightline, Oct. 27, 2014. The Marine Corps ended its mission in Helmand province, Afghanistan, the day prior and all Marines, sailors and service members from the United Kingdom withdrew from southwestern Afghanistan. Another chapter in the Afghanistan War closed today as U.S. Marines, sailors and British forces left Helmand Province and transferred Camp Leatherneck and Camp Bastion to the Afghan National Army 215th Corps. Regional Command Southwest is the first of the International Security Assistance Force commands to transfer authority to the Afghan national security forces as ISAF moves toward the Resolute Support mission that begins in 2015 according to a Department of Defense news release. During the past year, Bosnia, Estonia, Denmark, Georgia, Jordan and Tonga ended their operations in Regional Command Southwest.